There’s lobbying, and then there’s working with Jack Abramoff to promote the sweatshop economy on remote Pacific islands. If you want to know about that kind of lobbying, you can ask Patrick Pizzella, President Donald Trump’s pick to be deputy labor secretary. Or maybe you can’t. 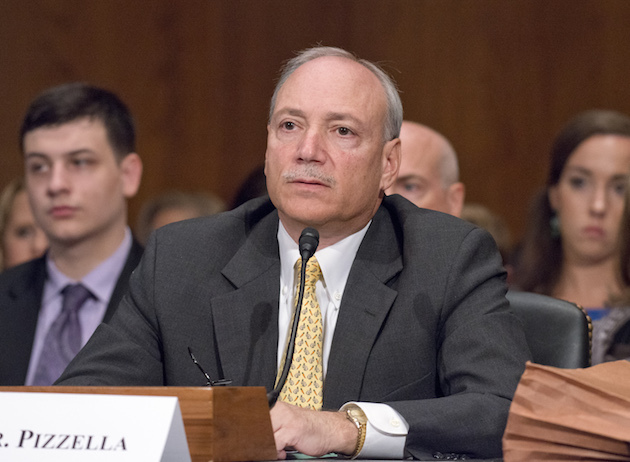 Pizzella at his Senate confirmation hearing in July. Pizzella arrived at the law firm Preston Gates in 1996 as Abramoff’s second hire. “Smart, likeable, clever, and hardworking, Pat was a perfect addition to the quickly emerging ‘Team Abramoff,’” Abramoff wrote in his 2011 memoir, Capitol Punishment. Pizzella immediately started reading up on Abramoff’s new lobbying client: the Commonwealth of the Northern Mariana Islands (CNMI), a string of 14 tropical islands just north of Guam with a population of about 53,000. The year before, Abramoff had learned that the CNMI was looking for a lobbyist to fend off increased federal control. During World War II, the islands were under Japanese control until the United States won the Battle of Saipan (the CNMI’s main island) in 1944. After a few decades in limbo as part of a United Nations trust, the Northern Mariana Islands opted to join the United States in 1975 as a commonwealth instead of pursuing independence. The agreement between the islands and the United States granted two exemptions. First, the CNMI could set its own minimum wage. Second, the commonwealth would be allowed to make its own immigration laws. CNMI officials initially requested control of immigration to ensure that the indigenous population would not be overwhelmed by newcomers. But a decade later, garment manufacturers and the CNMI’s government decided to use the exemption to import unlimited guest workers to make clothes for companies like Brooks Brothers and Banana Republic. The clothes they produced were stamped “Made in the USA” and exported to the United States tariff-free. Between 1985 and 1998, CNMI garment exports grew from almost nothing to more than $1 billion annually—over a third of total CNMI business revenue. “Things were just completely out of control,” says Allen Stayman, the top Interior Department official assigned to the CNMI from 1993 to 1999. Recruiters illegally required many foreign workers to pay fees in order to land jobs in the CNMI, causing them to go into debt that they’d have to work to pay off. Others signed “shadow contracts” in which they promised their employers not to unionize, date, or practice a religion while working in the CNMI. Some were made to sleep a dozen to a room, with barbed wire surrounding their barracks. If workers complained, the CNMI government, which had close ties to the garment industry, could deport them immediately. In 1992, Willie Tan, a top garment industry baron, paid a $9 million settlement in a Labor Department suit alleging he’d failed to pay workers overtime and the CNMI’s minimum wage of $2.15 an hour—compared with $4.25 elsewhere in the United States. The settlement was the largest in Labor Department history at the time. When Abramoff signed the CNMI government as a client in July 1995, the US Senate had already unanimously passed a bill to strip the islands of its minimum-wage exemption, setting up what looked to be an uncontentious vote in the House. The year before, representatives from the Interior and Labor departments and the US Immigration and Naturalization Service had testified at a Senate hearing about mistreatment of foreign workers. CNMI Gov. Froilan Tenorio joined them to say he was “disgusted” and “ashamed” by the stories of human rights abuses. “Unfortunately,” he added at the hearing, “they are generally accurate.” Still, the workers kept coming. According to a 1998 federal government report, “indentured alien workers,” mostly from Bangladesh, China, and the Philippines, made up 91 percent of the CNMI’s private-sector workforce. The majority of citizens, on the other hand, worked in better-paid government jobs. Immigration laws that were supposed to protect the CNMI’s indigenous population had made many citizens into overlords who were outnumbered by their guest workers. But Tenorio argued that the CNMI could fix the problems without eliminating the exemptions. Other lobbyists, Abramoff wrote in his memoir, told Tenorio that preserving them was a lost cause. Abramoff disagreed. To save them, Abramoff wrote, he told the governor’s chief of staff that the CNMI just needed to convince the conservatives running Congress that the fight was about defending a free market. The view from the Hyatt on Saipan where Pizzella’s guests usually stayed. Another Abramoff tactic, according to a Senate Finance Committee investigation, was to have the CNMI funnel money to a front group, which helped the trips appear independent. Before a 1996 junket, Preston Gates billing records show, Pizzella met with Amy Moritz, president of the National Center for Public Policy Research (NCPPR), a conservative group that funded several trips for Abramoff, to discuss a “CNMI trip and possible funding arrangements.” After he got back, Pizzella explained in an email to Abramoff how a report by Cato fellow Doug Bandow would be paid for. “[T]hat leaves basically the fees for Bandow’s services and report; and the reimbursement for the bills he accumulated,” Pizzella wrote to Abramoff. “…That should come to about $10,000. That is the amount CNMI should provide as a grant to NCPPR. Then they can cut check to Bandow.” Preston Gates billing records include an $8,000 invoice for Bandow’s trip expenses that lists NCPPR as the vendor. As Abramoff’s clout expanded, Preston Gates’ payments from the islands rose from $100,000 in 1995 to more than $3 million in 1997. (In 2001, The New Republic reported that Pizzella made $175,000 per year.) Then Tenorio’s uncle ousted him from the governorship as the islands’ tourism industry tanked during the 1997 Asian financial crisis. The next year, Preston Gates’ CNMI income dropped by more than half. To cover the shortfall, Abramoff turned to Willie Tan, the garment magnate. In a 1998 memo to a Tan Holdings official, Abramoff laid out a six-part strategy for representing Tan and the government. Pizzella was tasked with running the trips program—the importance of which “cannot be overstated,” Abramoff wrote. 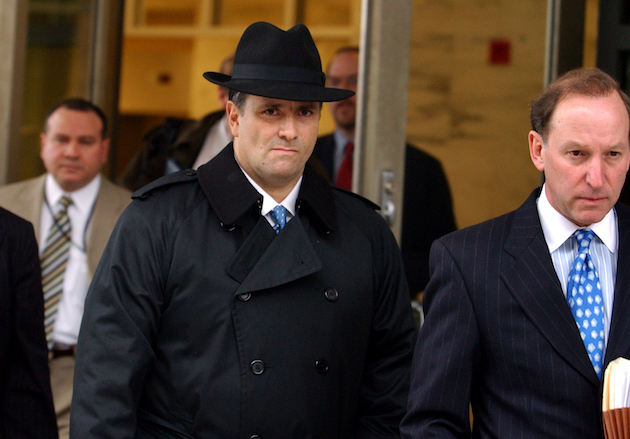 Jack Abramoff leaves a federal courthouse after entering a plea agreement on three felony charges. In 2001, Abramoff moved on to the lobbying firm Greenberg Traurig, where he continued to work on behalf of the CNMI. Instead of following him, Pizzella joined the George W. Bush administration as the chief of staff in the Office of Personnel Management. But Pizzella had made his mark as a lobbyist for the CNMI. By 2001, more than 100 thought leaders and lawmakers had made the journey to the CNMI, according to reporting by the Wall Street Journal and other outlets. “If you were a conservative intellectual and you didn’t get invited, you just knew you weren’t cool,” a source told The New Republic’s Franklin Foer in 2001. In 2007 and 2008, after Abramoff and Pizzella had stopped lobbying for the CNMI government, Congress overwhelmingly passed bills revoking the islands’ wage and immigration exemptions. Following a World Trade Organization agreement eliminating tariffs on US apparel imports from abroad in 2005, the CNMI’s garment industry all but disappeared. At Greenberg Traurig, Abramoff took his influencing to new, and frequently illegal, levels. In 2008, he received a four-year prison sentence for charges including corrupting public officials, tax evasion, and conspiracy. The fraud Abramoff perpetrated against Native American clients got most of the attention, but in Abramoff’s plea deal, a January 2000 trip to the CNMI was included as one of many examples of how Abramoff provided golf and other “things of value” in exchange for “official acts and influence.” Twenty-one people were ultimately found guilty in the Abramoff scandal. Pizzella was not charged.